Mikael Strandberg is a self-made explorer, author, blogger, documentary film maker from Sweden. http://www.mikaelstrandberg.com. He is also largely responsible providing faux-explorer Ripley Davenport with critical credibility at the outset of Davenport's imaginary career by promoting Davenport on Strandberg's own site. The most charitable interpretation of events is that Strandberg was fooled so early and so completely by Davenport's story he never did the simplest fact checking. It's a shame, because as a genuinely accomplished explorer, he should have had the persepective which would have made Davenport's claims easy to dissect. In 2009/2010 Strandberg played a critical role in Ripley Davenport's access to credibility by befriending Davenport, offering him (and Ripley's wife Laura) editorial space on Strandberg's website, recommending him to sponsors like Termo where Strandberg and Davenport are still listed as "Ambassadors". Strandberg has genuine accomplishments in terms of private explorations and long journeys. He has been recognized by the Royal Geographic Society, Explorers Club and given medals by various Scandinavian groups. One of Strandberg's big accomplishments was to "debunk" the story of "The Long Walk" demonstrating his willingness to put considerable time and energy into assuring that exploration reflects authentic and truthful portrayals of events. I first became aware of Strandberg when I came across his own article "Am I a fake and a cheat?" in which he explorered, with apparent sincerity, the question of authenticity in the modern explorer genre. Strandberg is also an official "Long Rider" and colleague of Cuchullaine and Basha O'Reilly at the Long Riders Guild where Cuchullaine maintains a "Hall of Shame" page and makes no bones about being a vigilante when it comes to posers and fakes. Thus it is odd that both Strandberg and O'Reilly with documented history of "zero tolerance" for frauds have come to the defense of Ripley Davenport whose fabrications and misrepresentations are legion and well documented. I have never had any suspicion that Strandberg was anything other than represented nor did I doubt he had done the things he claimed. I did, however, recently ask him to explain the background for being voted "explorer hero in 2002 by National Geographic". The communications department of National Geographic looked into the question as well and reported that "From what I have been able to gather, there was never an official award with this title." You are not a journalist or a member of the international exploration community. You are a private citizen who has demonstrated your willingness to invade my privacy. This email serves as a legal notice that you are to immediately terminate all communications with me. Any violation of my privacy will be immediately reported to the Swedish police. Furthermore, it is against EU and Swedish laws to steal my identity by setting up an Internet page in my name or contact my business associates in an effort to obtain personal information under false pretenses. I have consulted with the Swedish police about this matter and they are now monitoring the situation. They advised me to send you this email. I then learned that Strandberg has sent out the following email to an unknown list of contacts, declaring me, falsely, to be a criminal. Once upon a time, like 5 years ago, I helped a guy named Ripley Davenport. I did not know he had an enemy named Kent Madin from Bozeman, Montana. Since this time this cyberstalker has made a living hell for everyone that gave Riley a hand. Now it is my turn. I have spoken to people who have experienced this and they just say to write a note to people to make them aware that this unhappy individual might contact them. And the advice is not to answer. Than it will never end. I have also realized this is very common today for people who choose a different lifestyle. Obviously I have more skeletons than most in the wardrobe and if he writes to you and this email of his cause any questions, don´t hesitate to ask me. I will respond to your note and that will be the last time I contact you. My legal representatives may contact you however regarding the libelous email you have been distributing. I have copied this to the Swedish Police at brud.rps.polisen.se . Feel free to share your copy with your contact there. I have asked you one single, simple question via your public, advertised email address about an honor you claim to have received i.e. being voted "Explorer hero 2002" by National Geographic. Again, this is a public document supporting your commercial promotion of yourself as a speaker, guide, explorer, etc. I have not made any inquiry about your private life or invaded your privacy, but asked solely about your own public claims. In response you distributed the libelous email (included below) to an unknown number of unknown persons. Your email explicitly accuses me of being a criminal and irresponsibly repeats an allegation that you know has been thoroughly investigated and resolved by local police in Montana as of last year with no charges filed and the case closed. I would emphasize that, indignant allegations aside, I have never threatened anyone and I have not been anonymous. I put the Swedish police in touch with local authorities to verify that fact. In pursuit of the facts and details of the story of fraudulent and deceptive modern explorers and with guidance from established journalists I have followed the ethical guidelines of investigative journalism to the best of my ability. I have not created a website in your name and have no intention of doing so nor have I stolen your identity or any else's identity. Your concerns in that regard are misguided and untrue. Given that you decline to verify basic elements of your own CV, I reserve the right to contact anyone who may be able to verify those elements. This is a standard practice in journalism and my focus will remain your professional claims. I am not interested in your personal life except where personal matters are inextricably bound up in your professional story. While I am not familiar with the Swedish Constitution, I believe it generally parallels the Free Speech protections in the US. You are welcome to your opinion that I am not a journalist. Whether I am a member of the "international exploration community" (however that is defined) is irrelevant. Your professional story is of interest to me because your website is the virtual meeting room where other "explorers", some of dubious authenticity, gathered and built their public recognition and professional networks. It was you and your reputation that lent credibility to those connections. As you know, a number of those "explorers" have now been shown to have built their stories on fraud and/or misrepresentation. I would encourage you to take the simple path and engage in civil dialog. 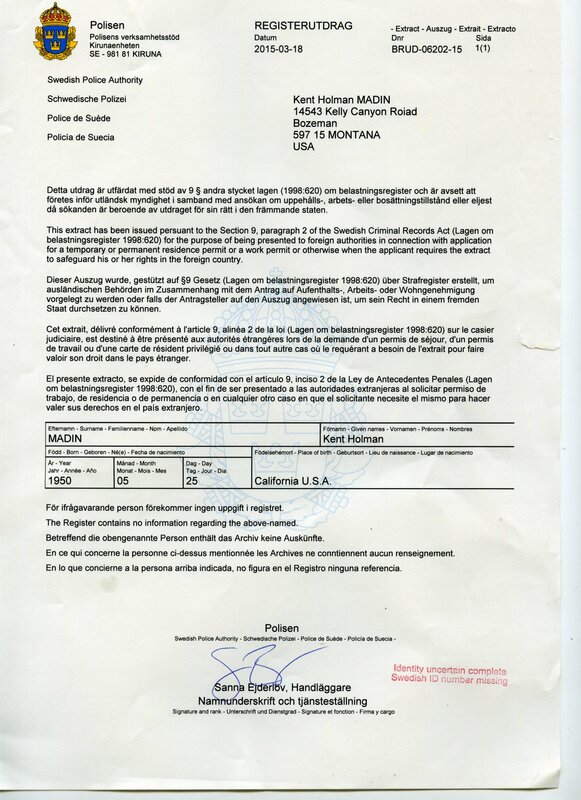 I was curious to see just what the Swedish police could add to this issue and after several emails and phone calls determined that, in fact, Mr. Strandberg misspoke (to put it charitably) when he said the Swedish police are "monitoring the situation" as this document, an official response to an inquiry regarding current or past police reports, makes clear. "The Register contains no information regarding the above-named". Furthermore, it is important to point out that setting up an internet page whose focus is another person and their professional career is not "identity theft", but Free Speech protected by both Swedish and US law. "Identity Theft" is when you anonymously pretend to be someone else to gain access to their money or otherwise harm them. The right to contact people other than Mr. Strandberg, whether as a journalist or private citizen, is enshrined in both the Constitution of the United States and that of Sweden. Mr. Strandberg has no legal standing for demanding that I NOT interview people who may have information that pertains to my story and my research. Mr. Strandberg does have the right to respond to questions, clarify discrepancies and to speak on his own behalf. It is a sad commentary on someone dedicated to exploration and the physical and mental challenges of same, who cannot simply stand up for himself and answer basic questions about his career. I have complied with Mr. Strandberg's request not to contact him. I will ignore his demand that I not contact other people. I have not threatened Mr. Strandberg, I am not anonymous and I have never attempted to obtain personal information under false pretenses. All my inquires, whether in regard to Mr. Strandberg, Mr. Davenport, the O'Reillys or Earl de Blonville have focused on their public statements about their business expertise and qualifications. Mr. Strandberg has very serious skeletons in his personal closet but I am only interested in whether there are skeletons i.e. fake claims, in his professional closet.